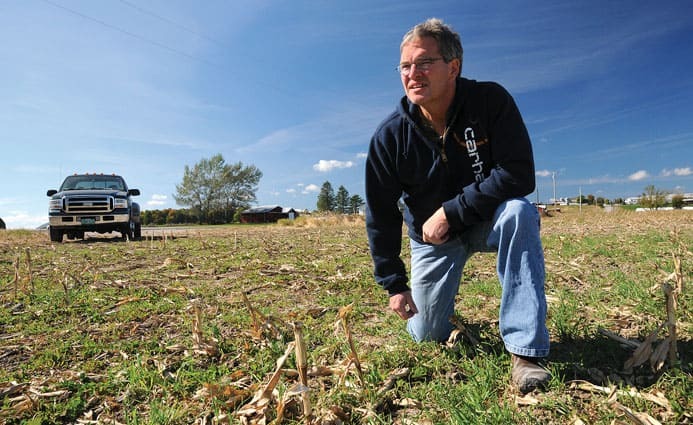 Orwell farmer Brad Thomas looks over a field of no-till corn planted with winter cover crops. Thomas is one of only a handful of Central Vermont farmers using no-till farming to improve his farm’s profitability and to reduce phosphorus runoff. ORWELL—Drive the back roads of Central Vermont right now, and you’ll see acres and acres of plowed corn fields, giant clods of clay upturned, waiting for the cold and snow to break them into something more manageable, so that springtime harrowing can convert them into something like a seed bed fit for next year’s corn. Anyone who has ever planted so much as a zinnia in heavy clay soils can appreciate the wisdom of these conventional farming practices. Yet these very practices can have unwanted consequences to the environment when they lead to runoff of phosphorus into Lake Champlain. An Orwell farmer has committed a large share of his acreage to a system of farming new to Vermont—no-till planting—that agronomists say will substantially cut back pollution runoff while saving growers money. The system avoids disturbing soil with a plow, but instead leaves fields fallow in the fall with a cover crop, letting natural processes break down residue from the previous crop. The flow of phosphorus into Lake Champlain has prompted out-of-control growth of blue-green algae blooms and general degradation of Vermont’s largest body of water. In August, the Environmental Protection Agency announced new limits for how much phosphorus can flow into the lake, and the state announced a revised plan for meeting those limits. In Addison County—one of the most heavily farmed parts of Vermont—soil erosion and nutrient runoff from croplands and pastures contributes roughly 48 percent of the phosphorus runoff into Lake Champlain. Barnyard runoff contributes another two percent. Vermont Agriculture Secretary Chuck Ross said farms large and small will see on-site inspections and will have to begin following a range of industry standard best practices to prevent further pollution of Lake Champlain. Thomas, whose Jillian Acres is one of the first farms in Addison County to implement a no-till system, has embraced many practices to keep manure from his cows from flowing into waterways. A tour of Thomas’s farm reveals a number of farming practices that state and federal experts either recommend or require for reducing phosphorus runoff into Lake Champlain. A back acreage in a partly marshy, partly wooded area with a stream adjacent that eventually flows into the lake is no longer used for pasture. Cattle are now fenced off from this more sensitive area. Diversion ditches from the cow barns go into a vegetated buffer area that absorbs the nutrients in the manure. Several yards downhill from the cow barns is a new, giant manure pit that exceeds state standards, built with cost-sharing and engineering expertise from the Agency of Agriculture and the National Resources Conservation Service. Thomas first tried no-till in 2014, on 100 acres of corn of his Rutland County acreage and on 27.5 in Orwell. Counter to his worst fears, that year he had tremendous results with his no-till crops. The Rutland County no-till acreage yielded 25 tons to the acre, and the Orwell farm yielded 18 tons to the acre. Thomas said the sandy loam soil in Rutland typically yields around 20-25 tons per acre in corn silage, while the heavy clay soils in Addison County typically yield an average of only 10-12 tons per acre. Although no-till has been used for years in other parts of the country, it is still new to Vermont agriculture. Right now in Addison County, maybe one percent of all farmers are using no-till, said George Tucker, a soil conservationist with the Natural Resources Conservation Service’s office in Middlebury. But for Tucker and other agronomy experts—and early farmer-innovators like Thomas—no-till benefits farms and farmers, as well as Lake Champlain. Farmers in other parts of Vermont with more tractable soils don’t face the same challenges as those in Addison County, farming clay. Given the clay soil that makes up most of Addison County, farmers have been plowing in the fall, letting winter pummel the bricks of clay churned up by the plow, and then harrowing repeatedly in the spring to make the soil friable enough for planting crops. Corn is one of the most important crops for local dairy farmers, who chop it—stalk, leaves and all—into silage to feed their cows throughout the winter. Fall plowing is the conventional next step right after the fall corn harvest. But, as Tucker explained, acres of plowed fields, exposed for months, leads to soil erosion and runoff. To compound matters, phosphorus binds more readily to clay particles than to many other soil types, and clay particles are more water soluble than other soil types, which makes them likelier to travel farther, making their way into brooks, streams and rivers, and eventually the lake. With no-till corn, the farmer plants a cover crop while the corn is ripening in July or August, or after the corn is harvested in September or October. They then leave the nubs of stalk standing in the field and don’t plow, said Tucker. The cover crops take off after the corn is harvested and they get more sun, and they hold the soil and nutrients in place until it’s time to plant in the spring. Instead of harrowing repeatedly in the spring to make the ground friable, the farmer instead uses a special no-till drill that essentially discs the soil into shallow, narrow rows and slots seed into the ground. With no-till, said Tucker, farmers lose less soil to erosion, fewer nutrients run off into the lake because the cover crops help hold manure and other phosphorus sources in place, and farmers save on fuel, wear and tear on machinery and labor because they no longer have to work a field three to five times to prepare for planting. Over time, the soil itself improves because it’s not being compacted as much by machinery and because the natural processes of decay and regeneration—through earthworms, nematodes, bacteria and cover crop roots—are given a chance to rebuild the soil structure and enhance the natural tilth of the soil. In Addison County, that means the soil becomes less like plowed-up bricks and more like loam. It also becomes more capable of absorbing rain and snowmelt, which again causes less lake pollution. Given the challenges of growing corn for silage on clay soils, Thomas believes that no-till is worth the risk. “The clay heavy [soil] in this area, it grows alfalfa really good, but it’s a hit or miss for corn,” he said. “If you get too much rain it just drowns the plant or rots the seed or it just doesn’t take off. It’s damp and cold. Even if it doesn’t drown the plant it will set it back. Then when the sun does come out what happens is it dries out and there’s no water there and the clay bakes and it’s like concrete. So if the corn hasn’t popped through the clay yet it’s not going to because it can’t pop through concrete. This year Thomas planted 58 acres in no-till corn in Addison County and 155 acres no-till in mostly corn and some soybeans in Rutland County. The yield averaged around 10-12 tons per acre, including 40 acres that failed because of the record rains in June. Thomas adopted no-till originally because of the savings it would bring in terms of his input costs. He also said, partly in dead earnest and partly in jest, that in his Rutland County fields he tried no-till because he didn’t want to pick stones ever again. “In five to 10 years, we’ll see the real dividends,” he said. Leaders statewide have widely emphasized that cleaning up Lake Champlain is everyone’s responsibility—half of Addison County’s phosphorus runoff comes from streambanks, forested areas, parking lots, roofs, back roads, paved streets, wastewater treatment facilities and other non-farming sources. Yet no one can dispute that farmers have an especially important task in addressing Lake Champlain pollution. “Farmers like Brad who are willing to accept some risk in order to try new and innovative practices are really important to the industry learning new techniques that can benefit the lake and farm businesses,” said Kirsten Workman of the UVM Extension office in Middlebury. Gaen Murphree is a reporter for The Addison Independent, a sister paper to The Mountain Times, gaenm@addisonindependent.com.